© Porsche The 992-generation 911 sports car-which grows wider, boasts incremental power gains, and a host of new technology-is launching with the 2020 S and 4S models, which make their debut at the Los Angeles auto show and go on sale first, hitting the U.S. market in the summer of 2019. But the 911 is Porsche, so we understand the desire to proceed with care. 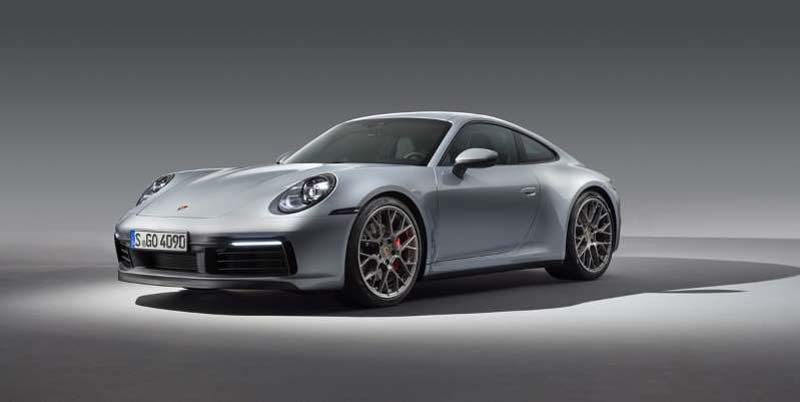 This 992-generation model-which grows wider, boasts incremental power gains, and offers a host of new technology-is launching with the 2020 S and 4S models, which make their debut at the Los Angeles auto show and go on sale first, hitting the U.S. market in the summer of 2019. 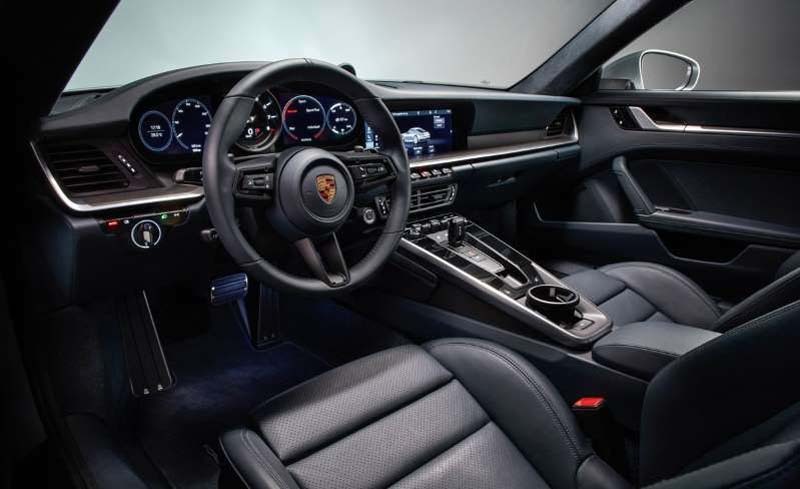 Initially they'll come only with the joystick shifter and the new eight-speed dual-clutch automatic transmission, but the seven-speed manual returns later in 2019 as the inevitable tide of additional 911 variants starts to roll out. Although we rode along with engineers in the new model a few months back, this is the first time we're seeing the new, fully uncamouflaged design. While the 911 is a defining example in automotive evolution, there are a few identifiers on this new model that make it easy to spot. In a throwback to the original, a design cue that carried through more than three decades to the 1999 996 model, the frunklid is squared off, with a slightly recessed center section defined by two prominent creases. In back, there's a Panamera-esque full-width light bar. The center brake light is now vertical, integrated into the slats on the engine cover. New on-demand exterior door handles stay flush to the body and pop out when needed. Dimensionally, the 992 is 0.8 inch longer on an unchanged 96.5-inch wheelbase. Also unchanged are interior and cargo volume. But all versions of the new car inherit the wide-body rear end from today's all-wheel-drive and GTS variants. The new car also grows 1.8 inches in width at the front end to accommodate nearly the same stretch of front track width. The S models make 443 horsepower, effectively notching up to former GTS-grade power. 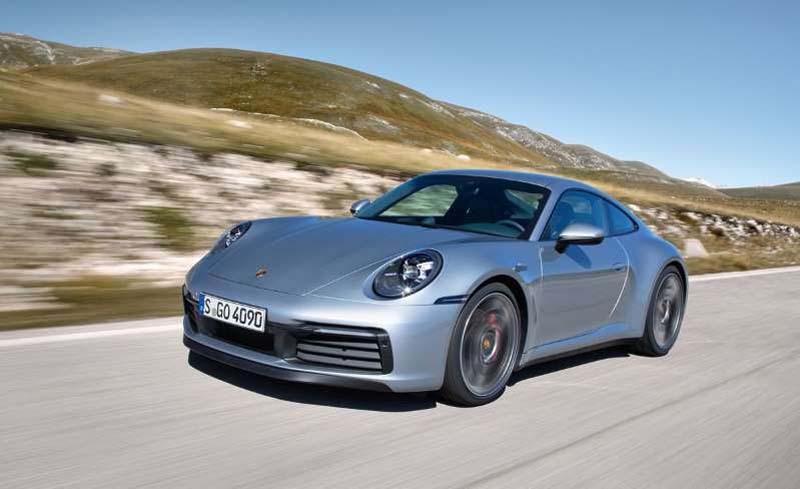 Porsche confuses the matter slightly by rating this new engine at 443 horsepower rather than the 991.2 GTS's 450 hp-with a slightly evolved version of the twin-turbo 3.0-liter flat-six. And it makes that additional power with no increase to boost pressure, but rather by other changes, such as a larger intercooler, a compression ratio increased from 10.0:1 to 10.5:1, and a switch to piezo injectors. Euro-spec models also add a particulate filter to meet tightening emissions standards, which we're told has a muffling effect. U.S. cars, which won't get it, will be slightly louder. 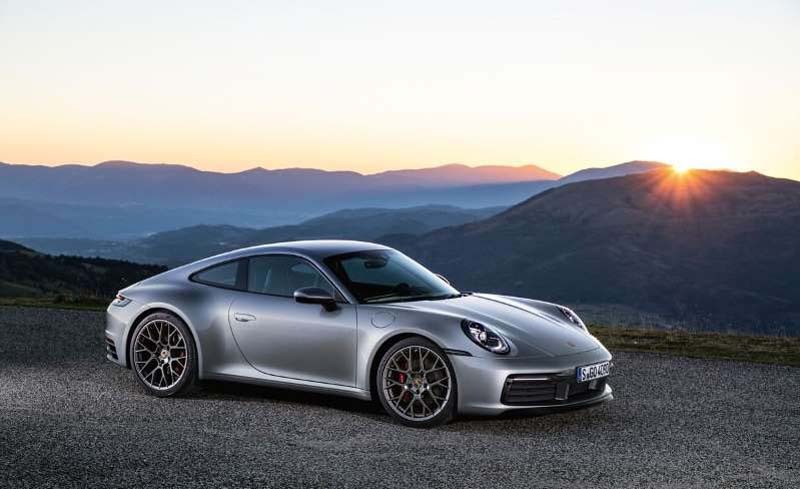 With the optional Sport Chrono package and the launch-control functionality it adds, Porsche says that the new S model reaches 60 mph 0.4 second quicker, which, according to our testing of the current model, means the new S could be in the high-two-second range. The 4S is a tenth quicker still. At 191 mph, top speed for the S is a single mph higher-2 mph higher at 190 mph for the 4S-and achieved in sixth gear. The 992 models wear wheels and tires that are no wider but an inch larger in diameter in back, either 19-inch fronts and 20-inch rears or a 20-/21-inch combo. Achleitner says that the additional rear diameter not only improves longitudinal grip but also allowed Porsche to run tire pressures that are slightly (3 psi) lower to improve ride quality. Pairing with the better ride is reduced wind and road noise due to improved insulation and higher stiffness of key chassis components. But the improvements are not only to comfort; Achleitner promises better turn-in response resulting from the wider front track and the 10-percent-quicker steering ratio, and improved brake feel from a revised system that now uses an electrically assisted brake booster rather than a vacuum-fed unit. Porsche says the new eight-speed PDK automatic shifts as quickly as the insanely quick seven-speed unit in today's GT3, GT3 RS, and GT2 RS models. The slightly larger rear spoiler has two deployed positions for the first time (a low-angle, minimum-drag position in addition to a steeper max-downforce angle), but, in a reminder of regulation pedantry, U.S. cars will only deploy to the steep angle because the position of the third brake light doesn't adhere to federal standards in its lower position. Porsche is also debuting a water-detection feature on the new 911, which places an additional ultrasonic sensor (essentially a parking sensor) in the back of each front wheel well. When the sensors detect sufficient water being flung off the front tires, it triggers a revised calibration for the stability control plus a warning message for the driver to switch into wet mode on the steering wheel mode-control switch. That brings even further changes, including putting the rear spoiler into its highest position (for cars that have both modes), along with adjustments to the differential calibration and additional torque to the front axle on all-wheel-drive variants. The redesigned interior has a number of new features, including a standard 10.9-inch touchscreen that is incorporated much more elegantly than today's norm of plopping a large screen atop the dash. Nestling it into the console leaves a shelf to rest a palm while poking at it. 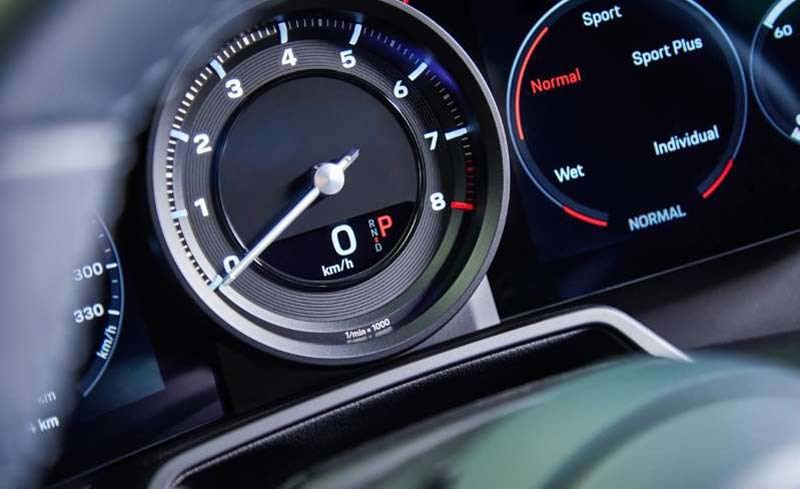 The gauge cluster now has but one analog gauge-a large center tachometer-flanked by two screens, and the 911 also gains new tech such as a 360-degree camera display as well as a night-vision feature. Behind the shift lever is-ta-da-the 911's first ever large center cupholder. In what appears to be a quick adaptation from the Panamera's layout with numerous haptic controls that surround the shifter (which we've found fussy to use), the 911 doesn't have any. But that leaves a large section of blank gloss-black plastic trim. Despite weight-saving measures such as rear fenders that are now made out of aluminum-they extend all the way from the rear taillights to ahead of the doors and require nine processes to stamp them-the new car is no lighter overall. That's due to concessions made to accommodate a future hybrid model. Although the hybrid isn't planned for at least three to four years, according to Achleitner, there's already space between the engine and the new eight-speed that can house an electric motor, and Porsche has beefed up various structural and body components in anticipation of passing crash-test regulations once the large battery pack joins the party. Porsche pricing is something that evolves at least as fast as the 911 itself, and it has been increased substantially for the 992, to $114,250 for the S and $121,650 for the 4S. But part of that increase over today's $106,150 and $113,050, respectively, is that the PDK automatic is now standard rather than a $3210 upcharge. There's other additional standard content, too, such as heated seats and automated emergency braking. The manual becomes a no-cost option and, effectively, a lot more expensive. But at least Porsche still offers it, largely due to the high take rates in the U.S., and an example, like the 911 itself, of not messing with success.